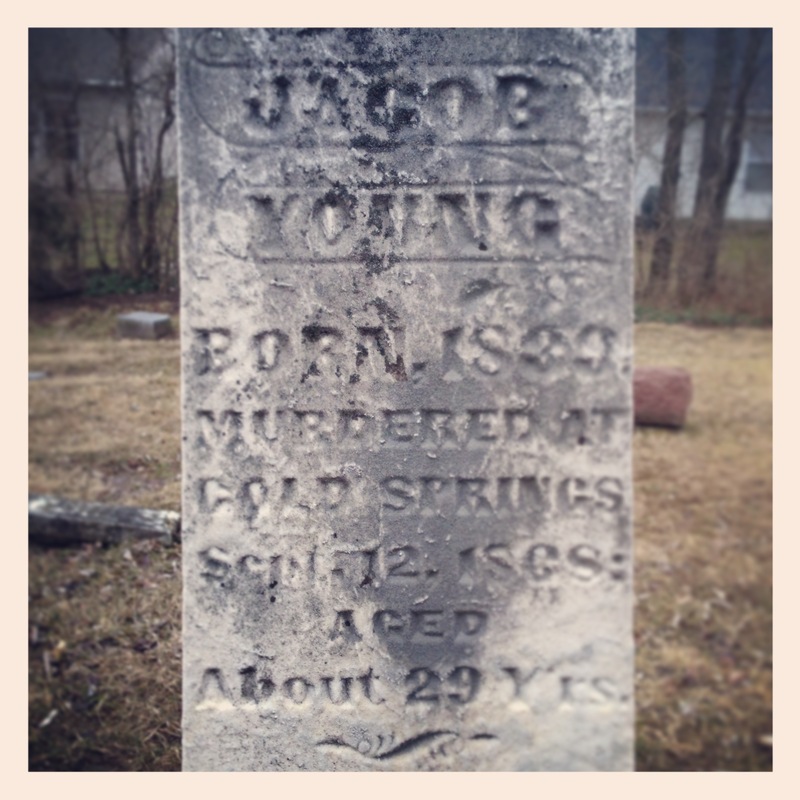 Tombstone of Jacob Young, behind the Indianapolis Church of Christ on 6001 W. 52 St. 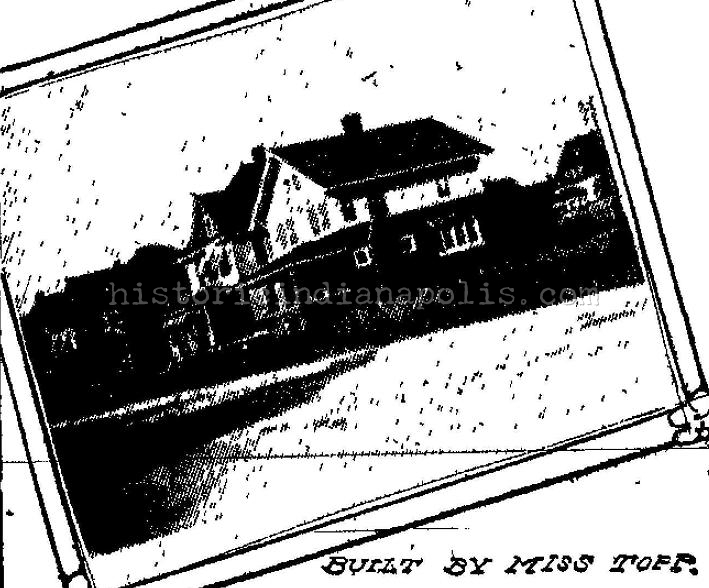 This week is the third and final of a three week visit to the intersection of Cold Spring and Lafayette Roads, on Indianapolis’ near westside. Just off the banks of the White River, not long after Col. Lew Wallace was training his 11th Indiana Volunteer Regiment in 1861 but before Carl Fisher and his automotive contemporaries were living large at the Indianapolis Canoe Club was an 1868 double murder that captivated the city and the nation until being over shadowed by Lizzie Borden in 1892. On September 13, 1868 the bodies of a man and a woman were discovered in the woods of what was then Cold Spring, a riverside getaway six miles northwest of Indianapolis. A good part of the man’s face had been blown off, apparently by the shotgun that lay a few feet away. Flies buzzed around his body, spiders and black beetles crawled about his wound. Witnesses—even those who had grown accustomed to the numerous “grisly horrors” that befell the soldiers who fought what has been called the nation’s first modern war (the recently concluded Civil War)—found the second discovery, the smoldering body of a “small, delicate woman,” even more disturbing. She had been badly burned from the chest down, so badly that her intestines were exposed, the flesh on her thighs burned away, and the bones partially reduced to powder. “BURNED TO A CRISP,” the Indianapolis Journal would tastefully put it. 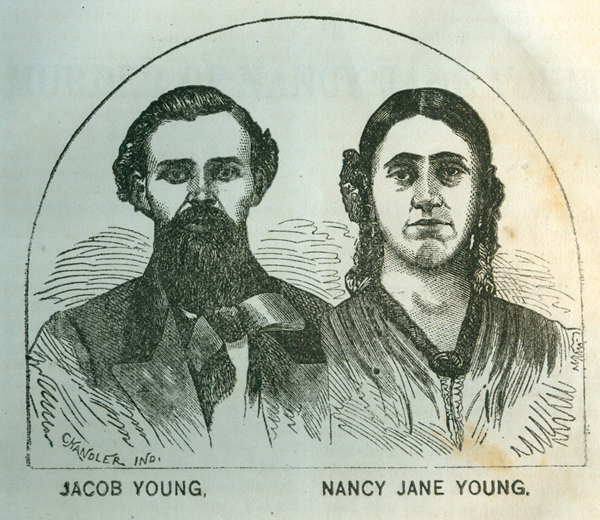 The bodies were soon identified as Jacob Young and his wife Nancy who were by all accounts “highly respectable residents of Indianapolis”, Jacob specifically being described as “an honest, industrious, thrifty citizen, respected among business men for his uprightness, and honored among his neighbors for his exemplary social qualities” by the Journal. It was initially thought to be a tragic case of murder-suicide, a husband dispatching his wife in a jealous rage and then himself in kind. But the location between the shotgun and Young seemed improbably far for him to have wielded it upon himself. It was then noted that Nancy was, in fact, shot with a pistol AND dealt a blow to the head with a blunt object. Finally, in what is a pretty impressive bit of forensic work for the late 19th century, a footprint was found that didn’t match the shoes of the victims’, that of a small, heeled lady’s shoe. And with that, evidence of a murderess on the loose, a media sensation was born. Two days later, again in what seems to be an impressive degree of detective work for the time, the shotgun was matched to one purchased by a William J. Abrams. Several days later, another man, Cilas Hartman was arrested, who had rented a buggy just before the murders, the attached mare named “Pet” who was shod with a distinctive type shoe, suspiciously similar to prints left near the crime scene. On October 7th, Harman’s sister, Nancy Clem, wife of a successful Indy grocer was arrested as well, suspected as the source of the lady’s shoe print at the scene. Much like the nearby White River, the story gets a little murky from here. Though the city’s paper touted Jacob Young as a pillar of the community postmortem, is actual standing was a little more nefarious. After being rejected by the Union Army during the Civil War and a stint working in hardware, Young teamed up with his long-time friend, one William J. Abrams and later with on Nancy Clem for a series of “mysterious and evidently profitable transactions” involving a “system of interchangeable loans taken out on high rates of interest”. 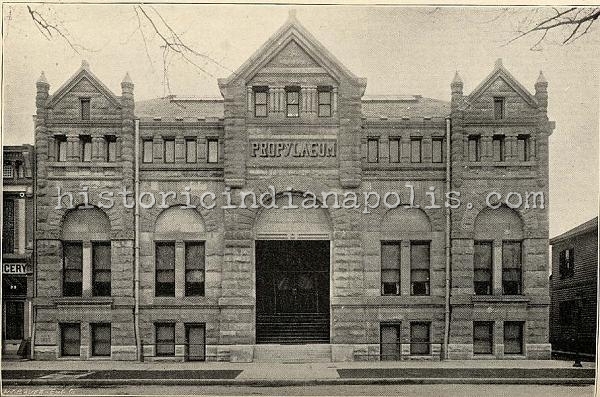 Indianapolis in 1868 was experiencing an explosion of growth. Money was to be made everywhere and get rich quick scams and hustles were prevalent. However, what Young, Abrams and Clem were likely up to was a precursor to the investment scam of the notorious Charles Ponzi (or more recently Bernie Madoff), offering investors extraordinary returns on their investments that are paid with new money by new investors. The three preyed upon friends and neighbors, Marion County treasurer Arthur L. Wright, the son of Calvin Fletcher (that of Fletcher place), Clem’s physician, William Duzan, and took one Robert Dorsey for $10,500 (about $170,000 in 1868). Still, they were certainly not the only swindlers in town and were there not two bodies discovered in the woods in Cold Spring, their misdeeds would have likely seen little to no notoriety. Why the three conspired to kill Young is unclear. Clem owed Young $22,000 from their misdeeds. It was known that Young had been carrying an improbably large about of cash on him the day of the murder for someone who died $40,000 in debt ($644,000 for those keeping track). The exact timeline was never agreed upon, but prosecutors suggested that Clem had ridden with Jacob and Nancy Young in their carriage to Cold Spring with Abrams and Hartman trailing in their rental buggy. The two men hid in the brush near the river and as the three passed, Hartman shot Jacob Young with the shotgun. Clem then shot Nancy Young with a pistol (which was never recovered) and then bashed her in the head with a rock when she didn’t die right away. Investigators were uncertain whether she was then set fire to or if the smoldering powder from the pistol ignited her petticoat. All three faced charges of first degree murder. Hartman issued a statement that implicated himself and Abrams but absolved his sister Clem from the murders. Shortly after, he committed suicide in his cell, though it was suspected that Abrams, his cellmate, may have done the deed himself. Abrams was convicted for the Youngs’ killing and sentenced to life in prison but was pardoned by Indiana’s 17th governor James D. Williams. 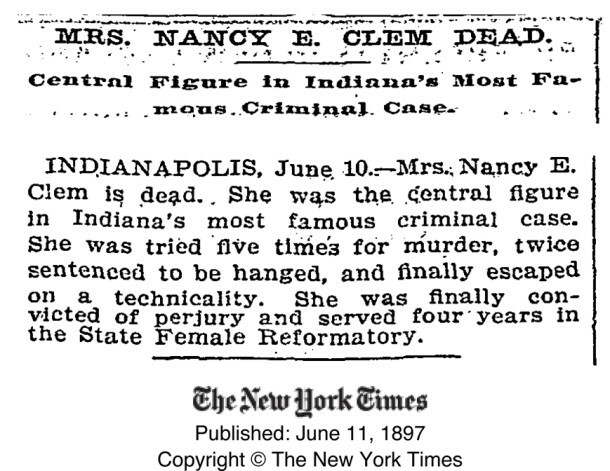 Nancy Clem was a whole other ballgame. 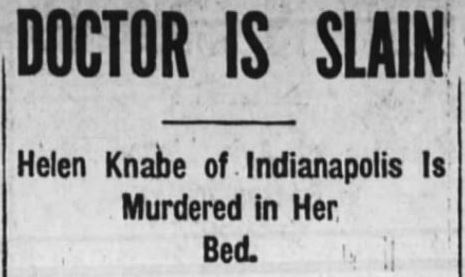 There had been female killers before in Indiana, but it was always a case of romantic intrigue; a cheating husband or lover, etc. That a lady was capable of such at premeditated crime was beyond the understanding of the time and led to Clem being tried FIVE times for the killings. The debate was over what a “lady” was and was not capable of, the defense at one point resorting to presenting a prostitute with the same shoe size as Clem as a possible killer, given that a woman of such low moral character was more likely a suspect. For their part, the prosecution took great pains to shine an equally bad light on Clem’s character, suggesting any number of sexual trysts between she, Jacob Young and some of her investors. 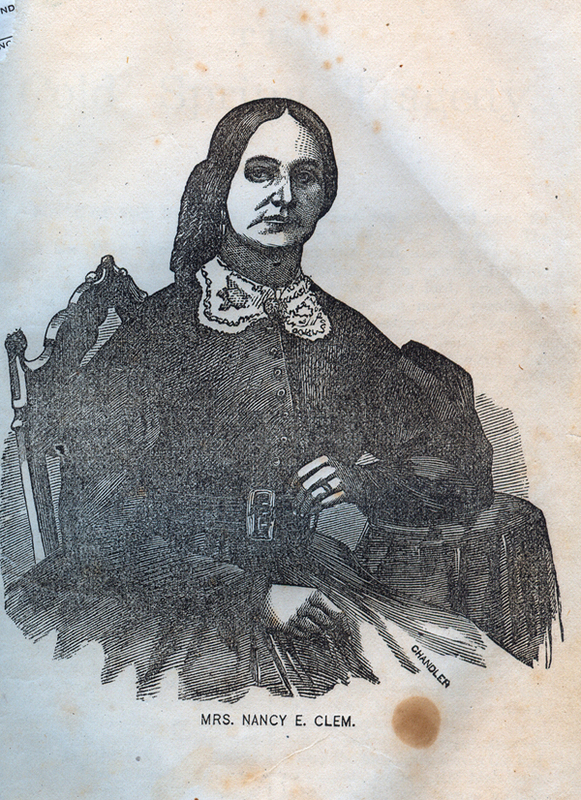 She was found guilty at one trial (though it was over-turned in another) partly because of the work of a young prosecutor named Benjamin Harrison (who was actually Clem’s neighbor, living two doors down from each other on the 200 block of N. Delaware St.). Harrison deftly and delicately managed to debunk Clem’s alibi, a process detailed in the biography Life and Public Service of Hon. Benjamin Harrison written by none other than one Lew Wallace. 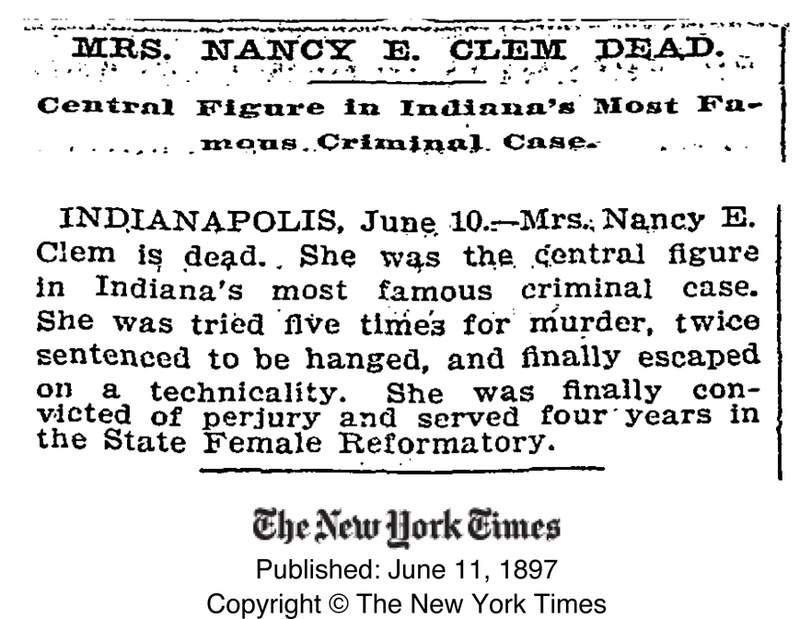 Via a parade of mistrials and appeals to the Indiana Supreme Court, Clem never served a sentence for the killings and returned to life as she knew it pretrial, engaging in small scale finance and real estate scams one of which she served her only sentence, four years for perjury and forgery. After her release and divorce from her grocer husband, Clem spent the remaining few years of her life hocking patent medicines to Indianapolis’ poor. She died of what was suspected to be stomach cancer in 1897 taking the truth about the Cold Springs killing with her to the grave. – All quotes and nearly all information above was found in “‘The Notorious Mrs. Clem’: Gender, Class and Criminality in Gilded Age America” by Wendy Gamber, professor of history at Indiana University. Professor Gamber is working on a book about Nancy Clem as we speak. Good Lord. Nineteenth-century journalism certainly was picturesque. Great article! Like that you were able to find the Young’s monument on the west side if town. Nancy Clem is buried in Crown Hill on her son’s lot. Her monument only reads “Mother”. I do include it on my skeletons in the closet II tour. This was interesting to read! DId you see that Indianapolis Monthly ran a feature article today that summarized some of the cruelest/chillingest crimes in the state? 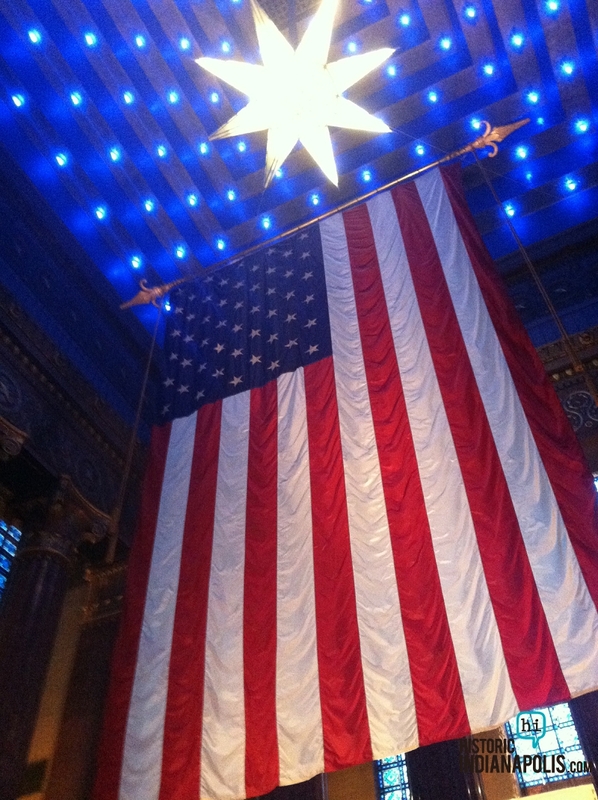 This story–the one of the Youngs and of Nancy Clem–was included! Granted, it certainly didn’t include this much information. This is one of those stories where you realize how connected the city was–everyone who had a history is involved somehow, including a future president. True crime tales of Indianapolis! I love it. More please. I have several questions: was William J Abrams a fair skinned black man that could have passed for white? Did he have any children? I searched him and I know that he was married twice and that this same William J Abrams was born 10/7/1833 and died 6/1/1910. The reason why I am so concerned is for years I dreamt about this area of the Municipal Gardens and it was a grave yard in my dream which could have been symbolic, but years later I dreamt of a black man name William that was wearing a Civil War Uniform and that has something to do with a murder. I thought that maybe he was murdered but when you did your story about the Cold Spring Murders and the name William was mentioned a flag went up. I searched for over a year and you were the only break in my dream. I’m not crazy but just a sleuth like you 🙂 Thanks in advance. I don’t know for a fact that William J. Abrams was passing, but I have a hunch that he likely was not. According to his listing on the rather macabre, rather awesome website “findagrave.com” he was enlisted in the 79th Regiment Indiana Infantry for three years. Governor Oliver Morton authorized the creation of the 28th Regiment Indiana Infantry to be composed of African Americans, but then again, if he was passing as you say, he would not have enlisted in the 28th. He himself was certainly not murdered but, in 1910, died of pneumonia at and is buried in the cemetery of the Indiana State Soldiers’ Home in Lafayette. I’m fairly certain that the Municipal Gardens area was never used as a grave yard, mostly due to its close proximity to the White River. One usually does not want their loved ones reappearing during heavy rains. As for children, the posting on findagrave.com is an obit from his 1910 passing, and mentions that he and his wife were both living at the Soldiers Home at the time of his death, but does not mention anything about leaving behind any children as well. Which is not to say that he/they may have not had any, but just that they aren’t listed as survivors. Ryan on the cold spring murders of Jacob Young – whatever happen to their young daughter?